In the wake of the police killings of Michael Brown in Ferguson, Missouri, Eric Garner in New York and Tamir Rice in Cleveland, Ohio, a Chicago police officer is set to stand trial in January on charges of involuntary manslaughter and other felonies in the 2012 off-duty shooting death of an unarmed black woman. Police shootings happen fairly regularly across the country, and as part of their job to serve and protect officers often kill dangerous suspects. The FBI Uniform Crime Reports indicate that in 2013, there were 461 justifiable homicides by police officers. Some estimate this number to be much higher – at least 1,000 – because not all police departments report their numbers to the FBI for inclusion in the report. So when does murder by a Chicago police officer cross the line from justifiable homicide to murder? There is no special statute protecting Chicago police officers who kill a suspect in the line of duty. Like any other citizen, Chicago police officers must prove that their use of force was justified. The use of justifiable force, as I have discussed before, is an affirmative defense. This means that the police officer has the burden of proving that his use of force was justified, and not the prosecutor. 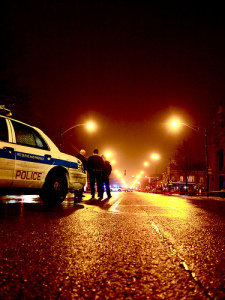 Under Illinois’ justifiable use of force law, a police officer may use force against another person if he reasonably believes that force is necessary to defend himself or another person against the victim’s unlawful use of force. However, the use of force likely to cause death or great bodily harm can only be used if the officer has a reasonable belief that he is protecting himself or another person from death or great bodily harm. It is important to note that the victim’s use of force must be unlawful, in order for force to be justified. This means that a person cannot put you in fear of your life, and then use deadly force against you when you try to protect yourself using force. How does this translate to real life? Take, for example, the Eric Garner case. Most people do not dispute that he was resisting arrest. But from the video, he appeared to be doing so peacefully, and posed no physical threat to law enforcement. So the argument could be made that the police officer’s use of a banned chokehold was unlawful use of force, since there was no reasonable justification to believe that he was in danger of death or great bodily harm. 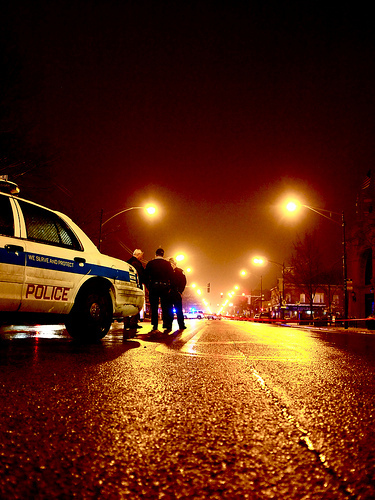 The vast majority of killings by Chicago police officers are ruled justifiable homicides and never brought to trial. The last case of a Chicago police officer facing criminal charges for a shooting death was 17 years ago. Defense in these cases rests entirely on the police officer’s testimony. Eyewitness testimony factors in to some degree, as would any available video. But in the end, the police officer’s testimony regarding his behavior and the victim’s behavior in the moments leading up to the shooting, and the officer’s level of perceived harm, is what the jury will ultimately rely on. And as is shown by the fact that it has been 17 years since the last Chicago police officer was brought to trial, in the vast majority of cases the benefit of the doubt goes to the officer. Whether you have been charged with first or second-degree murder, voluntary or involuntary manslaughter, the charge is serious. A murder conviction of any degree means the possibility of a lengthy prison sentence – possibly even life spent behind bars. Chicago murder attorney David L. Freidberg has nearly 20 years’ experience handling all types of Chicago murder charges, and will approach your case with the seriousness it deserve to get you the best possible outcome. With offices in Chicago, Skokie and DuPage County, somebody is available 24/7 to speak with you. Call our office today at 312.560.7100 to schedule your free initial consultation.